Let’s say you’re playing a dice game. I give you a chance to double your money. You have two options. Which will you pick? It all comes down to a game theory concept called dominance. Of course you’re going to pick Option 2. 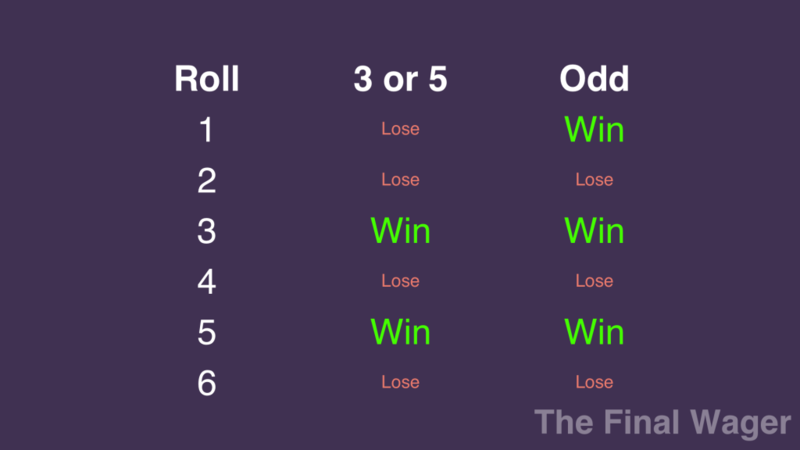 Either way, you’ll win if you roll a 3 or 5; but with Option 2, you’ll also win if you roll a 1. 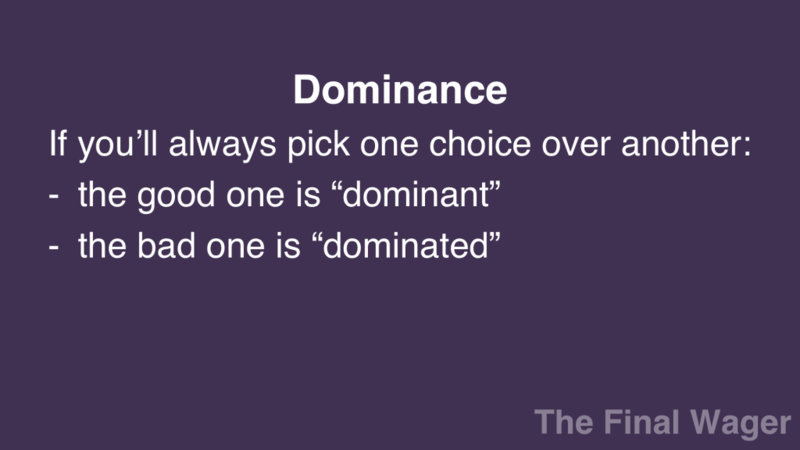 Dominance occurs when you’ll always prefer one option over another. Let’s return to our favorite payoff matrix, featuring our “big or little?” quandary. We had a set of optimal ranges for each player. What happens when we select something outside of those ranges? If the trailer wagers 5,000, he’ll be making a mistake. 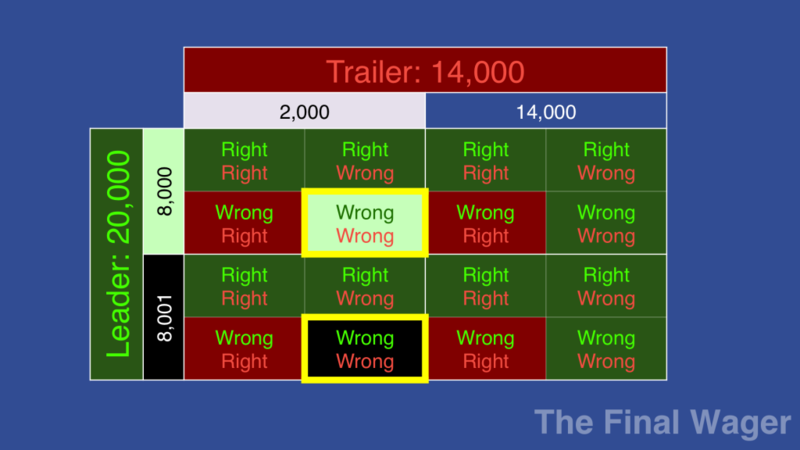 To see why, let’s look at the final scores with each combination of wagers and of right/wrong responses. 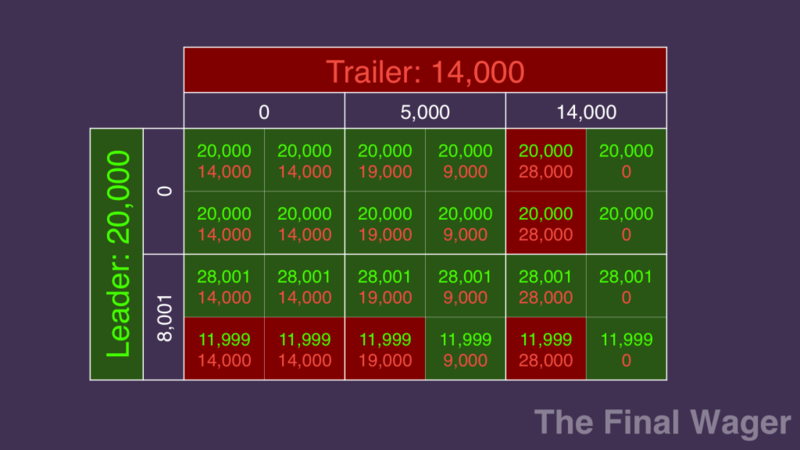 We boil that down to a larger payoff matrix, and draw in arrows to show each player’s preferred course of action. 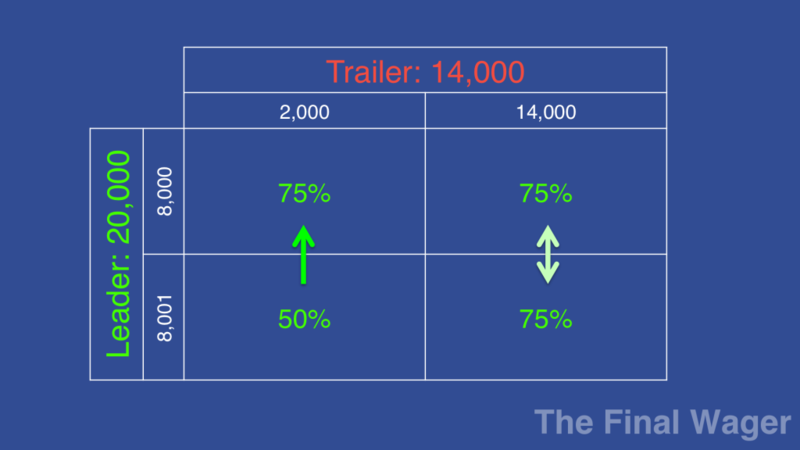 When we compare 5,000 with 0, we see that the trailer will either have the same expected payoff if the leader wagers “small”, or a better payoff if the leader wagers “large”. 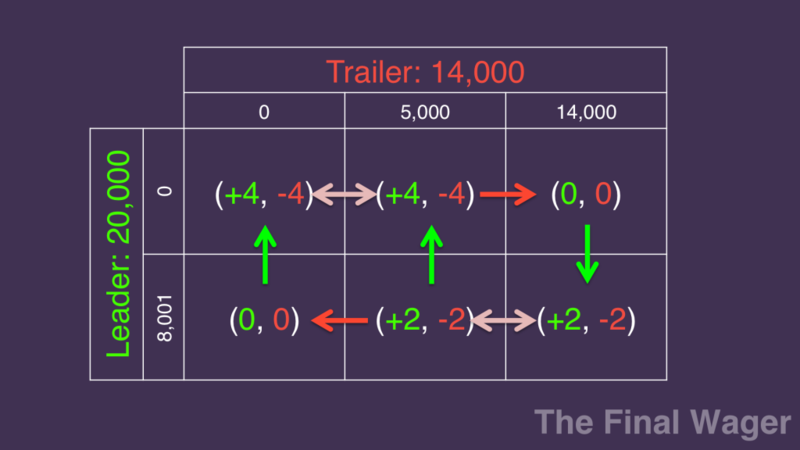 Similarly, when we compare 5,000 with 14,000, we see that the trailer will either have the same expected payoff if the leader wagers “large”, or a better payoff if the leader wagers “small”. 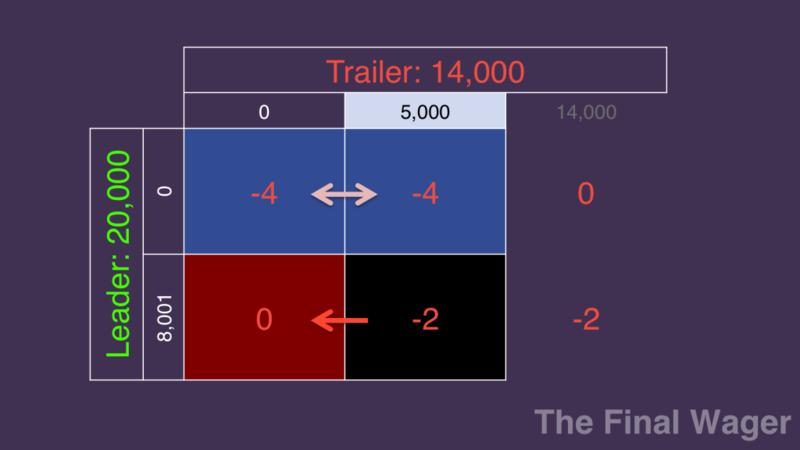 Because the trailer can only do better by choosing a wager in the optimal ranges, we say that the 5,000 wager is dominated and should never be made. Always take the higher expected value! Now we look at why I think leaders should always wager for the tie. 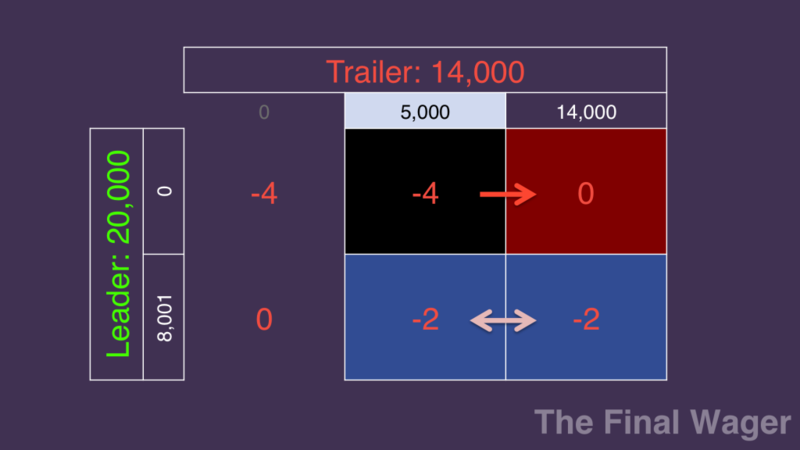 In that same situation, let’s compare outcomes if the trailer wagers either 2,000 or 14,000, and the leader wagers either 8,000 (for the tie) or 8,001 (for the outright win). We see that there are two scenarios in which the players tie – and in regular play, a tie is as good as a win. So we put that in green for our leader in the payoff matrix of outcomes. In any event – except for one – the leader has a 75% chance of winning. The exception is when he goes for the outright win – he’ll have a 50% chance. When we add the arrows, we can see that wagering for the tie dominates wagering for the outright win. Let’s look at it another way, by comparing individual outcomes. 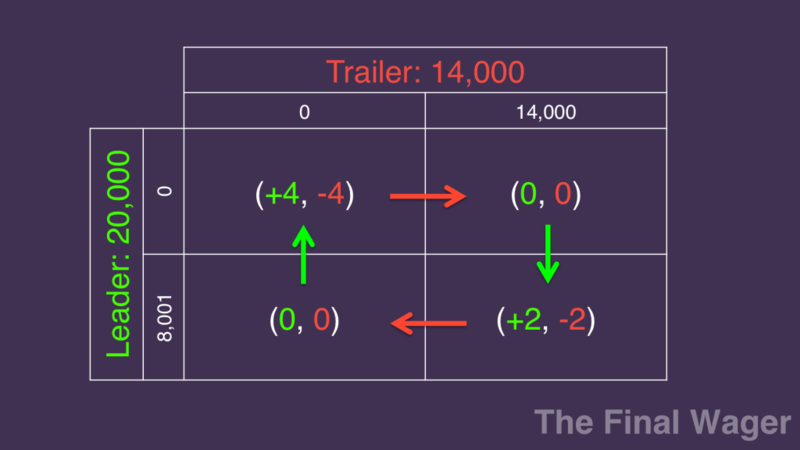 Everything is the same between the tie and win wagers for the leader, except for when (1) both players answer incorrectly and (2) the trailer wagers 2,000. I’d take my chances in a rematch, rather than risk losing to such a wager. A popular argument against wagering for the tie is along the lines of, “You don’t want to bring back an opponent who has experience on the buzzer.” My response is that you need to be in that next game for it to even make a difference! As an added bonus, if players know you’ll wager for the tie, they might wager everything, adding to your possibilities of winning. Tom Walsh is perhaps the most famous player to use this technique, which he called “The Praying Mantis”. I’m neutral on the opinion of tying vs. betting for an outright win (in regular games of course). One case where I’d veer on the side of adding the extra dollar though is if the player in second is a proven champion that I’d prefer to not face again. For that matter, I remember on the old Sony board with Larissa Kelly’s final (regular) game in 2008 (since it will mark the comment as spam I won’t post it here, but it is available at the J-Archive) she had a “Penultimate Wager” opportunity and some suggested she aim for a lock-tie; some of the boardies said that since she’s such a strong contestant they might consider going ahead and betting $1 to win outright anyway if in a similar position. On the other hand I like the strategy Tom Walsh had to encourage second to bet it all instead of following the standard strategy for 2/3+ games (and if we have a similar contestant in the future who has been known to offer a tie that will make betting everything – but not the common “everything but a small amount” – from second’s position a viable “alternative” wager). I don’t think I could forgo the [co-]win and the opportunity to call myself a Jeopardy! champion just so I wouldn’t have to face a megachamp in a theoretical second game. On the subject of a player in second betting everything but a small amount – IMO that’s often one of the worst wagers you can make from that position. It gives you the worst of both worlds – too little to usually win a Final you get wrong, and not quite enough to take advantage of a leader that offers a tie. About the only time that such a wager would be beneficial (tournament quarterfinals aside) are the very rare times when both the leader and third place go all-in (like the second Trebek game or the game in last year’s Teen Tournament) – I think it’d be MUCH more likely for a leader to bet for a tie than to (foolishly unless tied for the lead) bet it all. 1. Tie for the lead, no third contestant because he/she finished DJ! with <= 0 (this happened in reality on the June 12, 1998 game). 2. 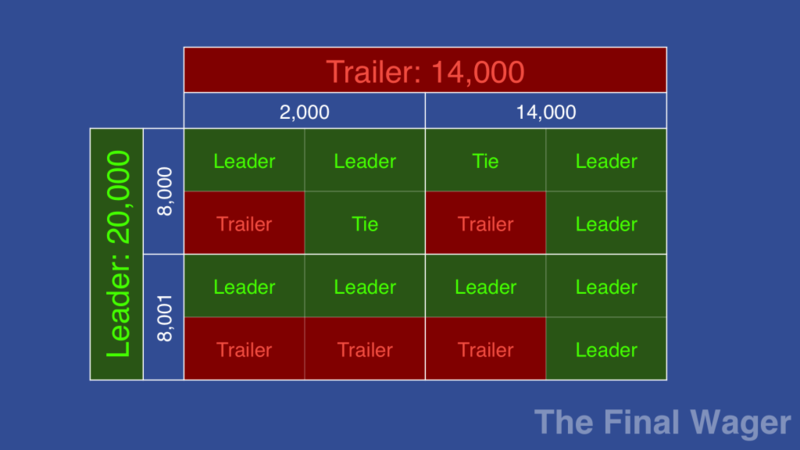 Tie for the lead, trailer has exactly half of the tied leaders' amount (since the trailer can either choose to bet it all in case one or both leaders bet nothing, or bet a non-everything amount to win if both bet it all and miss). 3. Three-way tie going into Final. 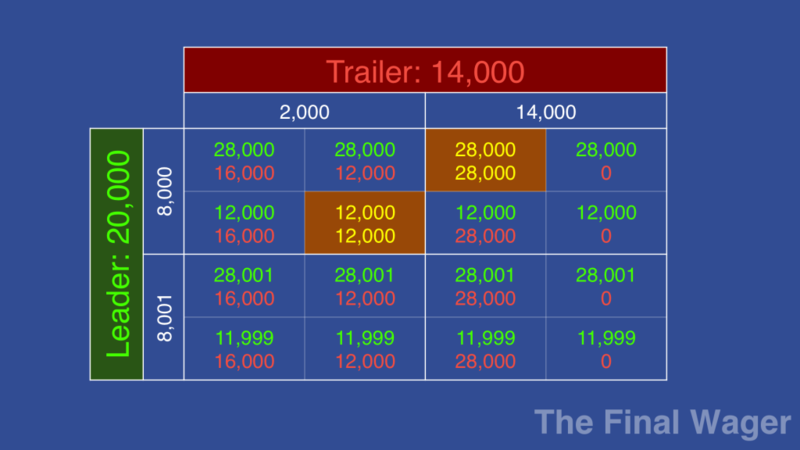 But why would the trailer wager a specific amount such as $2,000? It’s a particularly specific amount — what would compel him to do that? I’m not sure, but even mega-champions have pulled wagers like this. Note that in this case, Hunter went for the tie, and it saved his bacon. My point though is that $2,000 seems like an ultra specific bet for him to make, and seems like there’s no logic pointing him to making a bet like that. If that’s the case, then this scenario is based on a very cherry-picked hypothetical, no? I totally agree, Sam – in fact, Ben told me recently he had no idea why he did that instead of going for broke. The point was to demonstrate that there MIGHT be a situation where that extra $1 could cost you, which proves that the tie wager dominates the +$1 wager in terms of returning the next day.